This NPA is the only Wellness Therapies National Progression Award at SCQF level 5 offered by an Awarding Organisation. The NPA comprises of 7 mandatory Units, 7 optional units all at SCQF level 6. This qualification provides candidates with a broad understanding and knowledge across of range of Wellbeing Therapies such as massage, healthy eating and benefits of Wellbeing Therapies. This NPA is suitable for a wide range of candidates from school leavers to adult learners who wish to gain entry into the beauty industry. It also allows for straightforward progression to further study in HNC/D Holistic Therapies SCQF Level 7/8. Assessment is made up of both written assignments and practical performance supported by assessor. This award is suitable for a wide range of candidates and is suitable for: Post 16 School leavers; Adult returners who wish to gain entry into the Beauty industry; individuals who wish to gain an introduction to Wellness Therapies, candidates who wish to progress onto further awards but do not meet the entry requirements and Iindividuals who have skills and experience in Wellness Therapies and who wish to gain a formal qualification. Each unit of the award states that entry is at the discretion of the centre, however, it should be noted that some of these units can be delivered holistically e.g. 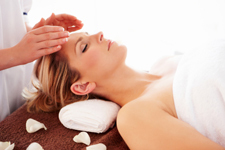 DN6C 33 Body Massage and F6XE 12 Scalp neck and shoulder Massage This may assist centres in creating a logical timetable for delivering the Units which facilitate candidates to build the required knowledge and skills. The units are designed to encourage candidates to take responsibility for their own learning and work to specifications. This qualification provides clear progression routes to other Holistic Therapy qualifications and provides relevant exit skills to enable a smooth transition to HNC/D Holistic Therapies SCQF Level 7/8. National Units at SCQF levels 1 – 6 comprise 40 hours guided learning and 20 hours self-directed learning. This means that the units in these frameworks have 6 SCQF credit points. One SCQF credit point represents a notional 10 learning hours. Credit points indicate the volume of learning required to achieve a qualification. Closed/Open book written assignments and practical performance supported by assessor observation checklists. Assessment Support Packs are available, for a number of the Units within this award. If a centre designs its own assessments, these should be of a comparable standard.